The Bogor Agricultural University (IPB) Education Laboratory Institution (PLP), which is supported by the IPB Human Resources Directorate, organized Independent Training on Educational Laboratory Institution Competency Development, at the Jannes Humuntal Hutasoit Auditorium, IPB Dramaga Campus, Bogor (1-2/8). This activity carries the theme, "Improvement and Development of IPB Educational Laboratory Institution Competencies". "The existence of a standardized laboratory that implements a good laboratory quality management system will be the right reference source for students and lecturers. Students will be familiar with the correct laboratory practices with sophisticated and fine tools. 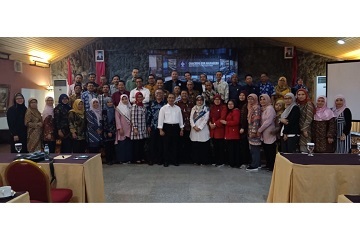 This insight will be very useful and helpful when students work in industries/companies that generally implement quality management system standards," said the Head of Sub Directorate of Human Resource Development and Career Systems of the Directorate of Human Resources of IPB, Suherman, SE. He added that the availability of well-managed laboratories will have positive impacts on improving academic quality. The laboratory is the spearhead for students and lecturers in conducting research and creating quality findings that are potentially commercialized/patented in order to support the achievement of world class university ideals. The Chairperson of the Training Committee, Bambang Hermawan, S.Bio, M.Si, explained that the purpose of this activity was to develop and improve the competence and knowledge of PLP IPB regarding laboratory equipment from simple to sophisticated ones. The Chairman of PLP IPB, Sofyan, S.Si, M.Si said, this training activity can provide meaningful benefits for all participants and can be applied realistically in the laboratory so that it can improve the quality of services in the laboratory with good human resource competencies. The number of PLP IPB members currently has 153 people. He added that the practice should be done in laboratories that support both facilities and human resources. This type of laboratory can be adapted to the types of studies in the field of science such as computer laboratories, chemical laboratories, microbiology laboratories, and so on. Laboratory facilities can evolve with funding support such as to purchase analytical equipment and safety and security support tools. "Human resources can be developed by the existence of various training both theoretically and practice directly to improve the competence of the laboratory field. Practicum and research activities conducted in the college education laboratory require qualified and competent human resources with functional positions in PLP. Therefore it needs a form of quality and sustainable training," he said.